BARE Blog: Tell Me About It, Stud. 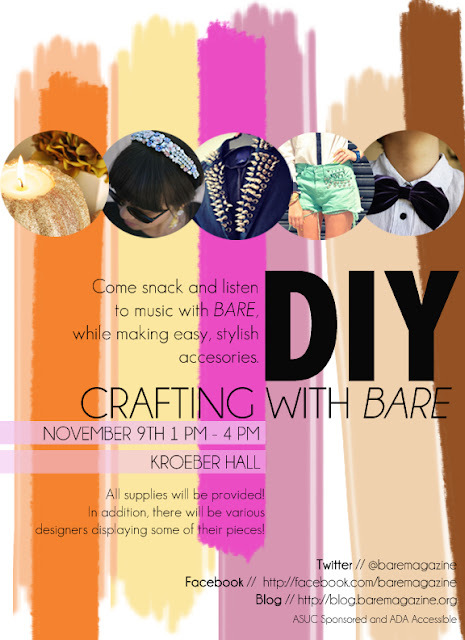 Join BARE for a DIY extravaganza this Friday, November 9th, from 1 PM to 4 PM in 120 Kroeber! We'll be studding, bejeweling, and glittering anything and everything you want to bring. Supplies to decorate everything from candle homegoods, to hair accessories, neck bow ties, and leather wrap bracelets will be provided. Bring a MAXIMUM of $10 to make all the items available, of course along with your favorite shorts, collars, shoes, bags, shirts, etc. Come prepared to get your craft on and DIY with BARE Magazine! Who could possibly say no to tasty snacks, jams from student DJs, and one-of-a-kind trendy clothes and accessories? We know we can't!